This is the Sweden I used to know when I worked there and went sailing there. But Sweden has changed probably faster than any other European country in the last few years. You may think that 17% of the population being non-ethnic Swedes is high, but not disastrous. However, that’s before you consider the age distribution of ethnic Swedes compared to those from other ethnic backgrounds. Within 20 years, the majority of Swedes of working age may be either foreign-born or the children of foreign-born parents. 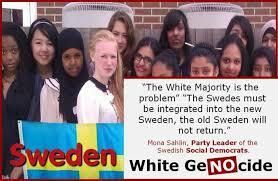 One commentator even predicted that ethnic Swedes would be a minority in their own country by 2041. I think that by 2050 looks more likely. Please note that these predictions of Swedes becoming a minority in their own country are NOT the rantings of some right-wing lunatic, they are simple arithmetic. 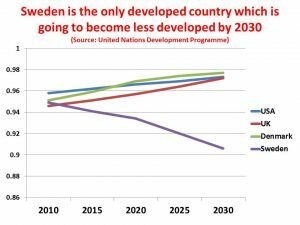 If the number of ethnic Swedes is declining and the number of non-ethnic Swedes is rising, then at some point ethnic Swedes will be the minority. 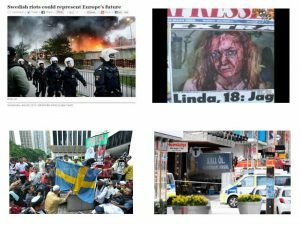 In just around 70 years – less than a normal lifetime – Sweden will have gone from a country with a 90% ethnic white majority to a country where ethnic Swedes are in a minority without a bleat of protest from ordinary Swedes. Tomorrow, I’ll look at the wonderful effects mass immigration are having on the once envied Swedish educational system. I have got to the stage that I don’t give a toss about Swedes, Sweden, Fins , Finland, Norway or Norwegians or any of the other European fu##wit countries like France and Italy and the Bosch, including the UK that is hell bent on taking it up the arse by the Muslim religion of peace. F##k the lot of them. Who are these c##ts ( clots)that think they have the right to do this to us ? The sooner this putrefied boil is burst the sooner that we & the people of Europe can get our act back together and change direction from the idiotic path that a worldwide collection of politically correct, gutless sh##head, so called leaders, have led us down. Bring it on Abdul, I am ready for you ! My experience of n#g n#gs is they will do f##k all unless they outnumber you 10 to one. I can tool up and carry a machete too if I need to. That means we have got about five years to go before the fun starts. An intelligent working class lad who should be admired throughout our land. Speaks more truth in one sentence than our parliament does in ten years. The police and our so called government have got it in for this boy. Maybe they are the problem and not tommy ? « Yet another hate crime that is NOT a hate crime?